One of the most joyous Muslim occassions, Eid-ul-Fitr is widely celebrated in all those nations wherever there is a presence of a Muslim community. Go thorough our wonderful article titled "Eid Celebrations Around the World" and learn how Eid-ul-Fitr is observed in different nations across the globe. If you like reading about Eid Celebrations Around the World, just click here and forward this page to those you love. Have a happy festive time! Marking the conclusion of the fasting month of Ramadan is Eid al-Fitr. This is related to the communal aspects of the fast, which depicts many of the basic values of the Muslim community, for example charity, empathy for the poor, steadfastness, patience, worship, etc. It is believed by some scholars that fasting is done to extol fundamental distinctions, praising the power of the spiritual realm, simultaneously acknowledging the subordination of the physical realm. It also teaches a Muslim to strafe away from worldly desires and to focus completely on the Lord and acknowledge Him for His blessings. It is a revival of the religion and it enables a stronger bond between the Muslim and his Lord. At the end of Ramadan, is the big celebration of Eid. Eid is celebrated in Africa by Muslims in several areas, particularly in Sahel, where Islam is adhered to by many and North Africa, the Horn of Africa. Tunisia enjoys three to four days of celebration, only 2 of which days are a national holiday, the 1st Eid and the second Eid. Preparations, however, begin several days earlier. Special biscuits are prepared to distribute to relatives and friends on the day, including several kinds of "ka'ak” and Baklawa. Early in the morning, men will visit the mosque, where as the women will either stay in and make preparations for the celebration by putting together new toys and outfits for their children, as well as a large family lunch usually held at one of the parents' homes or go with the men. There may be dancing and music during the daylight hours, but the feasting lasts throughout the day and several gifts are a large part of the custom. Also, food is the crux of this holiday, so this is another highlight of the evening. Different members of a family often visit each other. Generally, children accompany their father and visit grandparents, aunts, uncles, and friends to congratulate them on Eid. They will be offered special cookies and drinks. Women will stay at home with some of the kids and welcome members of the family that come to visit. In Egypt, Eid al-Fitr is a three-day feast and an official holiday, with vacations for, universities, schools and government offices. Several stores and restaurants are also closed during Eid. 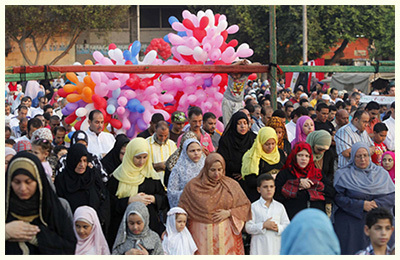 The Eid day begins with a small snack which is followed by Eid prayers in assemblage attended by children, men and women in which the Egyptians are reminded by the sermon, of the good deeds and virtues they should practice unto others, even strangers, during Eid and also throughout the year. Friends, relatives and neighbors start greeting one another afterwards. The most popular greeting is "Eid Mubarak." Family visits are considered mandatory on the first day of the Eid, so they can enjoy the other two days to enjoy by going to cinemas, parks, theatres or the beaches. Some like to go on a Nile cruise or on tours. One favorite spot popularly considered for spending holidays in Egypt is harm El Sheikh. Children are normally gifted new clothes to wear throughout the Eid. Also, women, especially mothers, wives, sisters and daughters are generally gifted special gifts by their loved ones. It is compulsory for children to also receive, from their adult relatives, an Eid-ey-yah. This is a minor amount of money that the children are given and is utilized to spend on all their activities throughout the Eid. Children will put on their new clothes and go out to gardens, amusement parks or public courtyards based on how much their Eid-ey-yah can afford. The amusement parks can range from the huge ones on the outskirts of Cairo-Nile, Felucca Nile rides being a common feature of Eid celebration in Egyptian towns, villages and cities. The family gatherings include preparing and eating all kinds of Egyptian food like Fata, but Kahk, which are cookies with nut fillings and covered with powdered sugar is the item most associated with Eid al-Fitr. Egyptians either buy it in the bakery or bake it at home. A bakery crowded in the concluding few days of Ramadan with Kahk buyers is thus a common scene. Egypt celebrates Eid in TV’s too, with a continuous marathon programs as well as movies which features live interviews from all over Egypt of both everyday citizens and public figures, sharing their Eid celebrations. The Eid celebration also means small mobile neighborhood rides for a lot of families from working neighborhoods, similar to a neighborhood carnival. Kids also gather around a puppeteer, a storyteller, or a magician in a lot of neighborhood courtyards, mesmerized by a grownup’s sleight of hand or Egyptian folktales. It is also mandatory for kids to rent adorned bikes to ride around town. Egyptians prefer to celebrate with others so the streets are always crowded during the nights and days of Eid. Eid al-Fitr is observed by the Muslim communities in Somalia and other Islamic parts of the Horn region. Celebrations marking the event are commonly complemented by elaborate banquets, where special dishes such as xalwo (halwo or halva) are served. Hundreds of Muslims will gather at Green Point in Cape Town in the evening of the concluding day of Ramadan each year for sight of the moon. The gathering brings people together from all walks of life, and everyone bring something along to share with others at the time of infringing the fast. The Maghrib or sunset prayer is then performed in congregation and the formal moon-sighting results are announced thereafter. Nigeria is officially a non-clerical country and is populated by substantial numbers of Christians and Muslims. In Nigeria, Eid is commonly known as "Small Sallah" and people generally greet one another with the customary greeting: "Barka Da Sallah," meaning "Greetings on Sallah" in the Hausa language. Muslims observe their Eid prayers at assigned praying grounds before heading home to take part in festive meals, usually prepared by the females of the household. The Federal holiday generally goes on for two days in Nigeria. The night before Eid, on the Indian subcontinent, is called Chaand Raat, meaning, "Night of the Moon." Muslims in these countries will often visit shopping malls and bazaars with their families for Eid shopping. Females, especially younger girls, will often apply the traditional henna or Mehndi, on their hands and feet and wear vibrant bangles. The customary Eid greeting is Eid Mubarak, and it is often followed by a formal embrace. Gifts are given frequently, new clothes being part of the tradition, and it is also popular for children to be gifted small amounts of money or Eidi by their elders. It is customary for children to offer salam to adult relatives parents. It is traditional for some families to go to graveyards and pray for the salvation of deceased family members after the Eid prayers. It is also traditional to visit neighbors and family members, especially elder relatives named Murubbis to get together to share snacks, sweets, and special meals which include some special dishes that are prepared specifically on Eid. Special traditional dishes in Pakistan, India, and Bangladesh include sivayyan/শিমাই or Lachcha/লাচ্চা or a dish of toasted and fine sweet vermicelli noodles with dried fruit and milk. On Eid day, people donate a charity commonly known as fitra before prayers. Many people also utilize this opportunity to distribute an Islamic obligatory alms tax of 2.5% of one's annual savings, known as Zakat, to the poor. Zakat is often distributed in the form of new clothes and food. 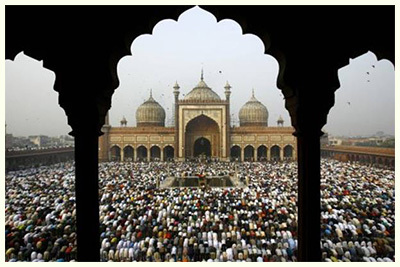 There were many popular places in India for Muslims to convene to celebrate Eid at this time include the Mecca Masjid in Hyderabad, Aishbagh Idgah in Lucknow, Jama Masjid in New Delhi. There is a prayer held on Red Road in Kolkata. Muslims turn out in thousands, as there is a lot of excitement accompanying the celebration of this festival. It is popular for non-Muslims to visit their Muslim friends and neighbors on Eid to pass on their best wishes. In the city of Hyderabad, Eid is celebrated grandly, as it has rich Islamic Heritage. During the month of Ramadan, a type of meat stew, Hyderabadi haleem, is a popular dish. It takes centre stage and becomes the main course at during Iftar, i.e., the infringement of the fast. In Bangladesh Eid al-Fitr is acknowledged over a three-day public holiday. Educational institutions generally remain closed for an entire week during this time. Bangladeshis practice the holiday by performing the mandatory Eid prayers on the morning of Eid, visiting friends and relatives and giving zakat and fitra,. Popular customs also include dressing up in new clothes, decorating one's hands with henna and having a good meal with family and friends. People wear new clothes to get ready for Eid prayer on the day of Eid al-Fitr in Pakistan. People are supposed to give mandatory charity on behalf of each of their family member to the poor or needy afore Eid day or at least afore the Eid prayer. This will allow everybody to feel the joy of Eid and not feel depressed. There is a national holiday for three whole days for Eid celebration, while greetings and festivities tradition generally continue for the entire month. Since a long time, there was a tradition that people send fancy and beautiful Eid greeting cards to relatives who are distant, family members and friends. People gather at large open areas like park grounds, sports grounds or large for Eid prayer. After Salat people meet and greet each other and mostly hug each other. People give charity to the poor and needy before going home, to further make it possible to have everybody be able to celebrate the day. People buy gas balloons for kids and gifts for the family and sweets on their way home. At home family members enjoy special Eid breakfast with various types of desserts and sweets, including traditional dessert sheer korma, which is made of milk, butter, vermicelli, dates and dry fruits. Eid is popularly enjoyed by the kids, as they majorly receive money in cash called "Eidi" as a gift by every elder in the family and relatives when they visit their places. Kids are allowed to spend their gift money as they want on Eid day. Media also airs various special programs on TV and covers Eid festivities all day for all age groups. In the neighborhood lots of game shops, mobile food shops, outdoor rides like see-saw, pirate-ship, ferrous-wheel, etc, are setup for kids to have fun all day. People pay a visit to their elder relatives first then others and friends all day and share the joy of the day. Some go to sea side, parks, rivers or lake fronts to enjoy and relax. Families assemble in the evening to enjoy an Eid dinner, planning on how to celebrate following days of Eid. Eid al-Fitr is celebrated with great affectation in Saudi Arabia. Saudis prepare sumptuous meals for family and friends and decorate their homes. In Saudi Arabia, Eid festivities may vary culturally depending on the region, but one common tie in all celebrations is of hospitality and generosity. Firstly, to gather at the patriarchal home after the Eid prayers, is common Saudi tradition for families. Young children will line up in front of each adult family member before the special Eid meal is served, who will dispense Riyals, Saudi currency, as Eidi to the children. Family members will also typically have a particular time where they will distribute gift bags to the children. These bags are often wonderfully decorated and contain toys and candies. Many shopkeepers will express their generosity during Eid by providing free Eid gifts with each purchase. For example, many of the chocolate shops will offer each customer, who buys a certain selection of candies, a free crystal candy dish along with their purchase. Many Saudis go out of their way to show their kindness and generosity in the spirit of Eid. It is common for even complete strangers to greet each other randomly, even by occupants of vehicles halted at stop lights. Sometimes even gifts and toys will be distributed to children by complete strangers. It is also common in some areas for Saudi men to go and purchase large quantities of rice and other staples and then anonymously leave them at the doors of those who are needy and less fortunate. In some areas in the middle of Saudi Arabia, for instance Al Qassim, it is a common tradition during Eid that on the morning and after the Eid prayer, people will put large rugs on one of the streets of their neighborhood and each household will cook a large meal where these meals will be shared by all neighbors. It is also a common practice that people will exchange places to try more than a particular kind of meal. In Turkey, it is a public holiday, where government offices and schools are generally closed for the whole three-day period of the festivities. The celebrations of this bayram are incorporated with national traditions. It is mandatory for people to greet one another with Bayramınız kutlu olsun or Bayramınız mübarek olsun. Mutlu Bayramlar is an alternative phrase for celebrating this bayram. It is a period for people to visit prayer services, wear their best clothes, which are referred to as bayramlık, and often purchased just for the occasion, visit all their loved ones, including relatives, neighbors, and friends and pay their respects to the departed with customary visits to cemeteries, where temporary, large bazaars of flowers, water, used for watering the plants adorning a grave, and prayer books are erected for the three-day occasion. Generally, the first day of the bayram is considered to be the most important, with every family member waking up early, and the men attending their neighborhood mosques for the special bayram prayer. It is of utmost importance to honor elderly citizens by kissing their right hand and placing it on one's forehead all the while conveying the bayram greetings. It is also traditional for young children go from door to door around their neighborhood, wishing everyone a "Happy Bayram," for which they are rewarded with candy, traditional sweets such as baklava and Turkish Delight, chocolates or a small amount of money at every door, similar to the custom of Halloween in the United States. Fund-raising events for the poor are organized by municipalities all around the country, in addition to public shows like concerts or more traditional forms of entertainment such as the Hacivat and0 Karagöz shadow-theatre and even performances by the Mehter, which is a Janissary Band founded during the days of the Ottoman Empire. Eid al-Fitr holds significant importance in the predominantly Sunni Muslim culture of Afghanistan and is celebrated widely for three whole days. The most popular greeting is Eid Mubarak. Among the Pashto-speaking community this Eid is called Kochnai Akhtar. Preparations for the Eid al-Fitr festival are started by Afghans up to ten days prior by cleaning up their homes. Khana Takani is the name of this practice in Dari. Afghans visit their local bazaars to buy sweets, snacks and new clothes. The special treats served to guests during the celebrations of Eid are Shor-Nakhod, which are made with chickpeas, Jelabi (Jalebi) and Cake wa Kolcha, which is a simple cake, similar to pound cake. On the day of Eid al-Fitr, Afghans will offer their Eid prayers first and then get together in their houses with their families, greeting one another by saying "Eid Mubarak" and usually adding "Eidet Mobarak Roza wa Namazet Qabool Dakhel Hajiha wa Ghaziha," which means "Happy Eid to you; may your prayers and fasting be acknowledged by God, and may the Hajj-pilgrimage involve you carrying it out ." Elders in the family will distribute gifts and money gifts to children. It is also customary practice to visit families and friends, which may be hard to do at other times of the year. Children walk from door to door and say "Khala Eidet Mubarak" and they receive cookies or Pala. In Indonesia Eid is known as Idul Fitri, and popularly as Lebaran, and is a national holiday. Bazaars and shopping malls are usually filled with people to get things for Lebaran like new shoes, sandals, clothes and also food to provide for the days ahead of Idul Fitri, which creates a distinct festive atmosphere throughout the country, along with the usual traffic mayhem. Several banks, government and private offices are closed for the duration of the Lebaran festivities. The prevailing custom of the Lebaran where workers, especially return to their home town or city to celebrate with their families and to request forgiveness from elders, parents and in-laws is one of the largest temporary human migrations globally. In Indonesia, this is known as mudik, pulang kampung or homecoming. It is a yearly tradition that people in big cities such as Surabaya, Jakarta, or elsewhere in Indonesia carry out. The government of Indonesia provides additional transportation to handle the large number of travelers. However, the impact is still massive as tons of cars and motorcycles jam the highways and roads, causing miles of traffic jams each year. The night prior to Idul Fitri is called takbiran. It is filled with the sounds of musallahs, people usually filling the street and also chanting takbir and those of many muezzins chanting the takbir in the mosques. Pelita or oil lamps, which are no different from tiki torches, are set alight and placed outside and around homes in many parts of Indonesia, and particularly in the rural areas. After performing Eid prayer in the morning on the Lebaran day, people dressed in their best or new clothes will assemble to greet their neighbors and family. It is customary to accost people with "Selamat Idul Fitri" meaning "Happy Eid". Muslims also greet one another with "mohon maaf lahir dan batin", which means "Forgive my wrongdoings, both emotional and physical" as EId-ul-fitri is not only a time for celebrations and enjoyment but also a time for self-atonement to beg for forgiveness for sins which they may have committed but was cleansed due to the fasting in the Muslim month of Ramadan. From morning to afternoon during Eid, the zakat alms for poors are generally distributed in the mosques. Families will usually have a special Lebaran meal. Special dishes will be served such as opor ayam, ketupat, sambal goreng ati, rendang, lemang and sayur lodeh. During this day, various types of cookies, kue and dodol sweet delicacies are also served. Younger families generally pay a visit to their older relatives or neighbors and wish and greet them a Happy Eid, and also to ask for forgiveness. Idul Fitri is a very joyous day for kids as elders git them money in colorful envelopes. On Eid al-Fitr, It is mandatory for Indonesian Muslims to wear traditional cultural clothing. Baju koko, a collarless long or short-sleeve shirt with traditional embroidered designs with a "kilt" sarung of songket, ikat or similarly woven, plaid-cloth, and songkok, which is a headwear, is the standard Indonesian male outfit. On the contrary, men may either wear more traditional loose-fitting trousers with colour-matched shirts and Western-style business suits, topped with a peci hat. Traditional female dress is called kebaya kurung. It generally consists of, a loose-fitting kebaya blouse, which might be enhanced with brocade and embroidery, the sarung skirt made of batik, ikat or songket or a long skirt both of which may be batik, and either the jilbab or its variant the stiffened kerudung. It is common for many Muslims in both Indonesia to visit the graves of loved ones post celebrations. They will clean the grave, perform the tahlil ceremony and recite Ya-Seen, a chapter from the Quran during this visit. In Indonesia there is a special ritual called halal bi-halal. This could be done several days after or during Idul Fitri. In Malaysia, Eid is more popularly known as Hari Raya Aidilfitri where Hari Raya means 'Celebration Day'. It is mandatory for workers in the city to return to their home towns to enjoy with their families and to plead forgiveness from elders, parents and in-laws. This is known as balik kampung or homecoming in Malaysia. It is mandatory for Muslim-Malaysians to wear traditional cultural clothing on Eid al-Fitr. The Malay variant, which is worn in Singapore, Brunei, Malaysia, Southern Thailand and parts of Indonesia, especially in Kalimantan and Sumatera, is denoted as the Baju Melayu, shirt and worn along with a sarong denoted as songket or kain samping and a headwear known as songkok. Clothing in Malaysia is referred to as Baju Kurung and baju kebaya. It is a popular practice however for the Muslim-Malaysians in Singapore to point out to the baju kurung in reference to the type of outfit, which is worn by men. People take turns to define a specific time for open house when they stay at home to entertain and receive family, neighbors and other visitors in Malaysia, especially in the major cities. It is not uncommon to see non Muslims made welcome during Eid at these open houses. 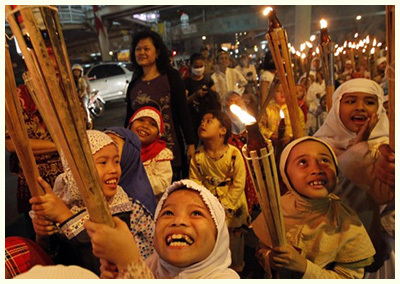 They also adorn by lighting traditional bamboo cannon firecrackers known as meriam bambu Ramadhan, or as meriam buluh in Malaysia, utilizing kerosene in Chinese imported crackers or large hollow bamboo tubes. The traditional bamboo cannon, meriam bambu, and fireworks are very loud and can be very hazardous to the operator, nearby buildings and bystander. These are usually bamboo tubes 5–10 cm in diameter and 4–7 m long, filled with either water or heated kerosene or several hundred grams of calcium carbide and then set alight by match. In the early morning during Ramadan, celebrating with firecrackers is now banned in many areas though many vandals bypass the law and disturb the neighborhood. In Malaysia, children are given small amounts of money, also known as "duit raya", from their elders or parents. Eid al-Fitr, known to the Christian majority and other non-Muslims in the Philippines as "Wakás ng Ramadán" or incorrectly as "Ramadan", has been considered a regular holiday by the Philippine Government due to the Republic Act No. 9177 and also according to Presidential Proclamation No. 1083, signed into law on 13th November, 2002, the only Christian country in the world to have done so. This law was brought about in deference to the Filipino Muslim community and to promote harmony and peace among major religions in the Philippines. The first national ritual of Eid al-Fitr, on December 6, 2002, was marked by celebrations and prayers by the Muslim community. Several of the Filipino Muslims will attend grand congregation like Qurino Grandstand and Manila Golden Mosque every Eid. Eid al-Fitar goes on for but one day among Burmese Muslims, who call the day Eid Ka Lay or Eid Nei’ or Shai Mai Eid. Burmese Muslims predominantly pursue courses in Sunni Islam in the Hanafi School of jurisprudence. Burmese Muslim youth organize singing teams called Jago, in Hindi and Urdu, which means "wake up", during Ramadan in the big villages and small towns with decent Muslim populations. Jago teams usually do not utilize musical instruments apart from the incidental use of harmonica mouth organs. These youth will walk around the neighborhoods prior to sunrise to wake up the fellow Muslims for the pre-dawn meal or Suhoor, which precludes the day of fasting. Gallivant groups of singers play the tunes of popular Hindi movie songs, replaced with Burmese invocations and lyrics about fasting, about the benefits of Salaat and the do's and don’ts of Islam. These songs could also be referred to as Qawwali, which are popular in Pakistan and India. Sometimes these Jago groups will also pay a visit to Muslim homes on Eid, where they are welcomed with monetary donations and food for the team with Eidi or Duit Raya. Most employers have an understanding of Eid and are usually willing to accommodate days off for Muslim staff even though this festival is not a public holidays in Burma. Few may even take some time off during office hours to pay a visit with Muslim staff to their homes, generally accompanied by other non-Muslim coworkers. It is sometimes tedious to reach consensus on the beginning and end of Ramadan as there is no unified Islamic authority in Burma to make official decisions on moon-sighting. This often results in Eid being celebrated on separate days in villages and small towns. The Eid al-Adha "Greater Eid" or "Festival of Sacrifice" is a public holiday in Burma as this event falls yearly on the month of Dhu al-Hijjah, the 10h day, in the lunar Islamic calendar. Eid al-Adha is only observed for a single day in Burma, not alike Muslim countries that observe a three-day festival. During both the Eids, the traditional greeting is merely the popular Islamic greeting of Assalamualaikum, and Eid Mubarak is only rarely heard. The greeting is followed by placing the right hand on the forehead, as if conveying a salute. There is no shaking of hands and seldom only includes a formal embrace. Food and gifts are frequently offered to the elder relatives and even to government authorities and non-Muslim employers. Burmese Muslims elders will offer Eidi gifts to children while new clothes are usually given to family members and coworkers. Children will receive token sums of money, even from strangers, especially if they went around the neighborhoods forming groups just for the purpose of collecting Eidi. It is not uncommon for young people and children to go around giving greetings of "salaam" to elder relatives, parents, and other elders in the community. Burmese Muslims beg for forgiveness from elders and parents and try to forget and forgive any misunderstandings themselves that may have occurred amongst one other during Eid. Sometimes Burmese Muslims perform or pray Eid salah at an Eidgah in open spaces outdoors. Burmese Muslim women generally do not attend the mosque or join with the men at an Eidgah. As Burmese Muslims are discouraged by the religious authorities from decorating their homes with lamps, lights or colorful bulbs, sending Eid cards, and more recently, sending e-cards via the internet, is quite common. Adults and children are also requested to not celebrate the religious festival with fireworks firecrackers. Out of 56 officially recognized ethnic groups in the People's Republic of China, Eid al-Fitr is celebrated by at least 10 ethnic groups which are predominantly Muslim. According to official statistics, these groups are said to total almost 18 million, but some observers say the actual number is probably much higher. In certain regions of China, including two Province Prefecture Level regions, Xinjiang and Ningxia, it is also a public holiday. Regardless of religion, all residents in these areas are entitled to either a three-day or one-day official holiday. Only Muslims are entitled to a one-day holiday outside the Muslim-majority regions. Eid al-Fitr is even celebrated by Han Chinese population in Xinjiang province, during which holiday supplies of beef, lamb and mutton are distributed to households as part of welfare program which is funded by private and public institutions and government agencies. Muslim populations are spread throughout the region in the Yunnan province. However, some devotees might travel to Sayyid 'Ajjal's grave after their communal prayers on Eid al-Fitr. There, they will hold readings from the Quran and clean the tomb, being reminiscent of the historic annual Chinese Qingming festival. This was where people went to their ancestors' graves, swept and cleaned the area, making food offerings. In Australia, a predominantly non-Muslim, non-clerical country, Muslims are able to celebrate their religion with immense freedom. Most large companies allow for special religious holidays allowing Muslims to take one day off for Eid al-Fitr. Areas where there is a large Muslim population have packed attendances at the mosque for the Eid al-Fitr prayer. Police often block roads off and divert traffic to serve for the prayer and subsequent celebrations. Eid prayers are also held in open areas such as playgrounds or stadiums, in some places. The Australian MEFF Consortium began the Multicultural Eid Fair and Festival to celebrate Eid in Sydney in 1987, held shortly after Eid al-Fitr. The festival has grown to now server tens of thousands of Muslims and non-Muslims and has included Hazem El Masri, the Governor-General of Australia then, Yusuf Islam, famous Australian footballer, Michael Jeffery and the previous Premier of New South Wales, Kristina Keneally as guests. This festival has now been reproduced in cities all over Australia. The biggest Eid fair in Melbourne is held in Broadmeadows generally on the weekend following the Eid day. In the capital of Australia, Canberra, Eid Festival is sponsored by Australian Federal Police is held on the Sunday following the Eid day. The festival includes rides for kids and adults, stalls from different nations, and cultutral programs. In the United States, most Muslims offer the Eid prayer in Islamic centers, open parks or convention halls. Muslims from different cultures with multi-national customs gather for celebrations and prayers. Prayers are practiced multiple times to accommodate the large number of attendees in some cities. Muslims generally visit one another’s homes on Eid or hold large feasts in community halls or mosques. Mosques, sometimes, rent parks for Muslims to pray in. Many Muslims join big parties funded either by an Islamic center or community mosque or by a wealthy Muslim in the community, during the 3 days of Eid. Children receive gifts, and all participants enjoy spicy, sweet and other flavorful delicacies. Many Muslims also provide money to those who are not so fortunate. Sometimes, Muslims book skating rinks, amusement parks or other activity centers for a whole day of fun. Alternate side parking regulations are suspended in New York City. The annual prayers are conveyed in Downtown Houston, in Texas at the George R. Brown Convention Center and organized by the Islamic Society of Greater Houston. The Postal Service of the United States has issued several Eid postage stamps, across several years, beginning from 2001, honoring two of the most prestogious festivals in the Islamic calendar, Eid al-Fitr and Eid al-Adha. Just as in the United States, a majority of the Canadian Muslims will take a day off from work and attend the prayers held at Islamic centers, convention halls, in big-city mosques or sports arenas for Eid al-Fitr. Muslims from different cultures with multi-national customs gather for celebrations and prayers. Congregational prayers may be done severaltimes to accommodate the large number of attendees in the larger cities of Montreal, Toronto, Calgary, Vancouver and Ottawa. Many Muslims will visit one another's homes on Eid or the days following to attend assigned "open houses" in which everybody is welcome to visit. Children receive money or gift, along with sweets and tasty dishes are also offered throughout the day. In the rural areas particularly, smaller Muslim communities hold other communal gatherings in rented community halls or mosques. Muslims also contribute to their local food banks or donate money on this day for those who are not so fortunate. Mosques and muslim organizations also arrange large Eid parties that are open to the whole Muslim community, in several Canadian communities. Some groups might reserve activity centers or amusement parks for an entire day of festivities and celebration, while others can hold public Eid parties in mosques as a means of reaching out to the larger non-Muslim society. Students from Canadian schools usually take two to three days off, due to the fact that Eid is such a major holiday in the Islamic culture. Although Eid al-Fitr is not considered to be a public holiday in the United Kingdom, many Muslims do attend the prayer in the morning. Local businesses and schools often grant exemptions to the Muslim community because of this holiday, enabling them to take days off, in large ethnically Muslim areas. Men of South Asian descent usually wear a jubba, thawb and sherwani, and women usually put on a salwar kameez during the morning. They will make their way to a local mosque for the Eid prayers, after which people greet one another. Some men may go to a local cemetery after Eid prayers to pay their respects to the departed and pray for them. Once they return home they will congratulate friends, family and other Muslims and pay a visit to relatives across the city. They might also cook cultural food and sweets for their relatives. Pakistani dishes such as Handesh, Noonor Bora, and Fulab and Bengali dishes such as samosas, Siweya, Rice are especially popular within those communities. Muslims consist of around 7%, or 63,000 people, of the total population of Fiji, a tiny tropical island-nation northeast of Australia. The Muslim community majorly comprises people of Indian origin, descendants of obligated laborers who were brought to the islands in the early 20th and late 19th centuries by the British colonialists. There is also belief to be a few hundred indigenous Fijian Muslims in the island nation, although no accurate statistic evidence exists. The large majority of Muslims in Fiji are of the Sunni branch of Islam who pursue courses in the Hanafi School of jurisprudence. 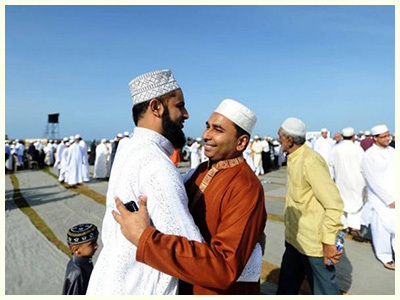 Eid al-Fitr is celebrated in Fiji with Muslim men wearing their prized clothes and visiting the mosque for the early morning congregational prayer. In most parts of Fiji, women do not go to the mosques for prayers. This is followed by visiting neighbors and relatives. Children receive money and presents from relatives, elder members of the family, and neighbors. Most Muslims will wear brand new clothes on this day, and serve a dish of sweet, fine vermicelli noodles mixed in warm milk known as samai. This is usually complemented by curried chicken, samosas and beef as well as sweets and Indian deliights for guests visiting throughout the day. The customary Eid greeting is Eid Mubarak, and it is often followed by a formal embrace. 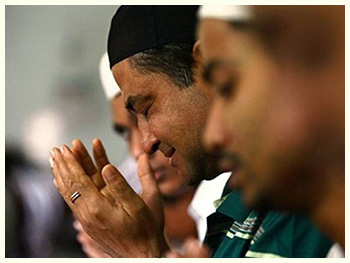 Mauritius is a diverse island nation where various religions live together in communal harmony. Muslims take up about 16.6% of the total population and Eid is considered a national holiday of this island, one of many. Eid itself is celebrated across the island, with the cooking of a feast, which mainly includes the "biryani". Men accomplish their Eid prayer at the Eid Gah or at the local mosques. In the days that follow Eid, cultural shows are usually performed.